A new study suggests that ancient periods of cold and dry climate helped our species take the place of Neanderthals in Europe. Researchers found that such cold periods happened at the same time Neanderthals seemed to disappear in different parts of the continent. Their disappearance was followed by the appearance of our species: Homo sapiens. Neanderthals are a species of early humans that once lived in Europe and Asia. The species died out about 40,000 years ago. Homo sapiens arrived in Europe a few thousand years later. Scientists have long debated what happened. Some have blamed the change in climate. Others have proposed explanations including the sudden spread of diseases and the idea that newcomers competed with the Neanderthals for resources. Michael Staubwasser is a scientist with the University of Cologne in Germany. He and his research team reported their findings in late August in the Proceedings of the National Academy of Sciences. The researchers examined existing climate, archaeological and ecological data and added new measurements of ancient climate. Those measurements came from two caves in Romania. Their study centered around two cold and dry periods. One began about 44,000 years ago and lasted about 1,000 years. The other began about 40,800 years ago and lasted about 600 years. The timing of those events matches the periods in which objects made by Neanderthals disappear. “Whether they moved or died out, we can’t tell,” Staubwasser told the Associated Press. 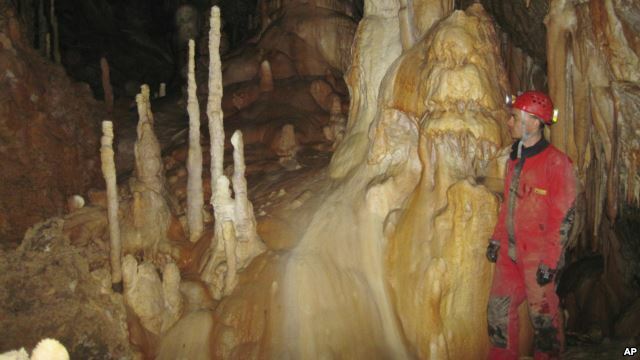 During the two events, signs of Homo sapiens appear in sites within the Danube River Valley in central and Eastern Europe and in France, the team noted. The changes in climate would have turned forests into grassland filled with small plants. Homo sapiens may have been better adapted to that new environment than the Neanderthals were. So they may been able to move in after Neanderthals disappeared, the researchers wrote. Katerina Harvati is a Neanderthal expert at the University of Tuebingen in Germany. She was not involved in the study. She said it is helpful to have the new climate data from southeastern Europe. That is an area that many researchers think Homo sapiens used to spread through the continent. But Harvati said it is unclear whether Neanderthals disappeared and Homo sapiens appeared at the times the researchers claim. She said that is because the studies they base their findings on depend on limited evidence and are sometimes disputed. Chris Stringer is with the Natural History Museum in London. He said he thought the paper made a good case for the effect changes in climate had on Neanderthals. Yet he believes other things also led to their disappearance. Rick Potts of the Smithsonian Institution called the study “a refreshing new look” at how one species took the other’s place. Malcolm Ritter reported this story for the Associated Press. Pete Musto adapted it for VOA Learning English. Ashley Thompson was the editor. We want to hear from you. How important do you think climate change is for both the past and future of our species? Write to us in the Comments Section or on our Facebook page.